I am always using either my tablet or smartphone while they are on the desk, counter or table, and have to keep picking them up to look at them. I got the Aleratec Universal Tablet/Smartphone Desktop/Wall Mount Stand so that I could mount my phone or tablet for easy viewing while I work on other things. 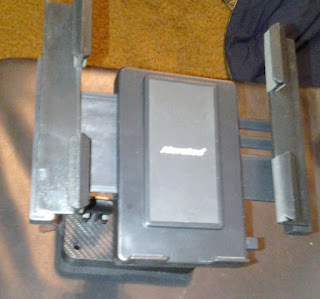 I love that it is fully adjustable to hold a wide variety of devices. It was easy to put together, and my son had it completed before I could even finish looking over the included diagrams. It held my phone and my tablet both well with no problems. It can be placed on a desktop or mounted on the wall. It even has suction cups so it could be stuck to a smooth surface such as the side of a refrigerator for easy viewing of a recipe while cooking. I haven't been using this for long, but it seems solid, so I don't expect any problems with it. If any problems arise I will update accordingly.